New York, NY – Dewa Budjana, Indonesian iconic guitar legend of Balinese ethnic heritage, is releasing his 3rd album (his 7th solo effort on his parallel jazz-fusion career) on MoonJune Records; the New York City independent label of progressive music that explores boundaries of jazz, rock, avant-garde, ethno & the unknown, run by its cosmopolitan honcho and executive producer Leonardo Pavkovic. 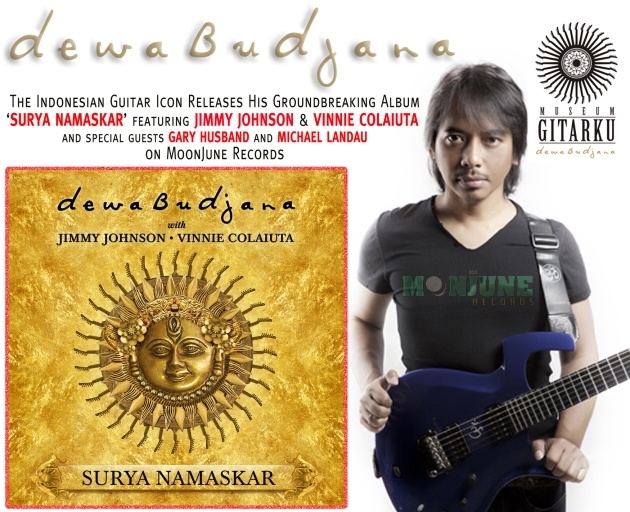 Recorded in Los Angeles by the world renowned engineer Robert Feist (who recorded Stevie Nicks, Anita Baker, and 8 albums of Allan Holdsworth, among many others) during two sessions in January and October of 2013, Surya Namaskar (Salute to the Sun, in Budjana‘s native Balinese language) represents a significant change from Dewa Budjana‘s last album, Joged Kahyangan. While bassist Jimmy Johnson (Allan Holdsworth, James Taylor, Flim & the BB’s) is back from that session, this time the drummer is the much in-demand powerhouse Vinnie Colaiuta (Frank Zappa, Herbie Hancock, Jeff Beck, Sting), with ubiquitous guitar session ace Michael Landau (James Taylor, Renegade Creation, Joni Mitchell) and drummer turned keyboardist Gary Husband (John McLaughlin, Allan Holdsworth, Jack Bruce) making valuable guest appearances on one track each. The sum total of Surya Namaskar is most definitely greater than its individual – monstrously talented – parts. Together with his two previous MoonJune recordings – Dawai in Paradise (January, 2013) and Joged Kahyangan (October, 2013) – Surya Namaskar paints the ongoing portrait of a guitarist who may be a superstar in the Indonesian pop-rock world as a founding member of the multi-million selling Gigi (one of the most prolific bands in Indonesian history, with 24 releases to their name, celebrating this year their 20th anniversary with their 25th album Live at Abbey Road, in which Budjana is the main composer and author of many hits), but whose lesser-known credibility and, more importantly, visibility as a jazz and fusion guitarist is slowly on the ascendance, as more and more international progressive music fans discover the depth, the heart, and the profound spirituality of Dewa Budjana, at fifty a new guitar hero of strength, creativity and significance. Located in the idyllic village of Payogan in Ubud, Bali, the original intent behind Museum Gitarku (Guitar Museum) was to store his beloved guitars (a collection of more than 130 guitars). However, in the development of the museum, designed by acclaimed Balinese architect Popo Danes as part of the 100-room 5 star Pakayon Hotel & Resort, Budjana felt that not only could it serve as a testament to his lifelong passion for the instrument, but also as his contribution for the people of Bali and Indonesia that would enable future generations to learn more about the musicians whose playing has graced the guitar over the years. The museum will feature instruments donated by an ever-expanding list of Indonesian and international musicians alike, from local guitar heroes of a country of 250+ million people, such as Chrisye, Rhoma Irama and Eross Candra, to world-renowned virtuosos and guitar legends including Allan Holdsworth, Robbie Krieger, Steve Vai, Michael Angelo Batio. Grand opening is planned for January 2015 with a special appearance by one of the world’s best known guitar icons.